Intern pharmacists must complete an intern training program in order to gain registration as a pharmacist. The Faculty of Pharmacy and Pharmaceutical Sciences offers an intern training program as part of the Graduate Certificate of Pharmacy Practice (P4001). undertake further study after your internship in specific areas of practice, by completing elective units (12 credit points) which cover topics in pharmacy practice, clinical pharmacy, economics and wound care. Completion of an Intern Training Program is a requirement for registration as a pharmacist in Australia. The Monash University ITP is a one-year part-time program undertaken via enrolment in PGP5011 Applied pharmacy practice 1 and PGP5012 Applied pharmacy practice 2 which make up part of the Graduate Certificate of Pharmacy Practice . The program is practice focused, utilises flexible delivery methods and is undertaken during the pharmacy intern year. It is designed to address all competencies required for initial general registration as a pharmacist. The program is aligned with contemporary practice. It is taught by over 70 practising and experienced pharmacists, representing a variety of practice settings. The IFP is an innovative program for intern pharmacists designed to recognise, support and enhance workplace learning. The IFP may only be undertaken concurrently with the ITP and is available to interns working in both community and hospital settings. Enrolling in both the ITP and IFP enables you to graduate at the end of your intern year with a Graduate Certificate of Pharmacy Practice . You will have an individualised workplace learning plan to ensure you are building your skills by completing activities relevant to your workplace and career development. You will also benefit from structured assessment and enhanced feedback from your workplace Clinical Educator. We are the oldest pharmacy school in Australia and with this history comes a prestige and reputation for producing quality, practice ready pharmacists. We are part of the National Alliance for Pharmacy Education (NAPE), which provides leadership in pharmacy education and aims to advance the pharmacy profession. 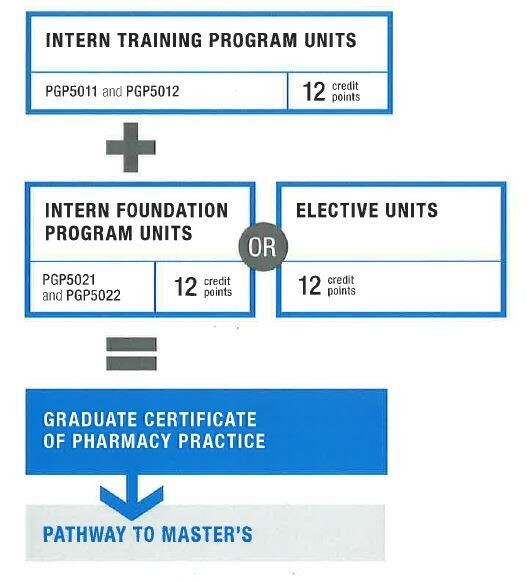 Option 1: Complete the Intern Training Program (ITP) plus the Intern Foundation Program (IFP) to obtain the Graduate Certificate of Pharmacy Practice qualification in one year. Option 2: Complete the Intern Training Program (ITP) in one year, and return the following year to complete two additional electives to obtain the Graduate Certificate of Pharmacy Practice qualification. The healthcare landscape is shifting dramatically due to the rapidly ageing populations and increased incidences of chronic disease. As healthcare changes to meet these challenges, pharmacists' expertise and responsibilities are evolving. 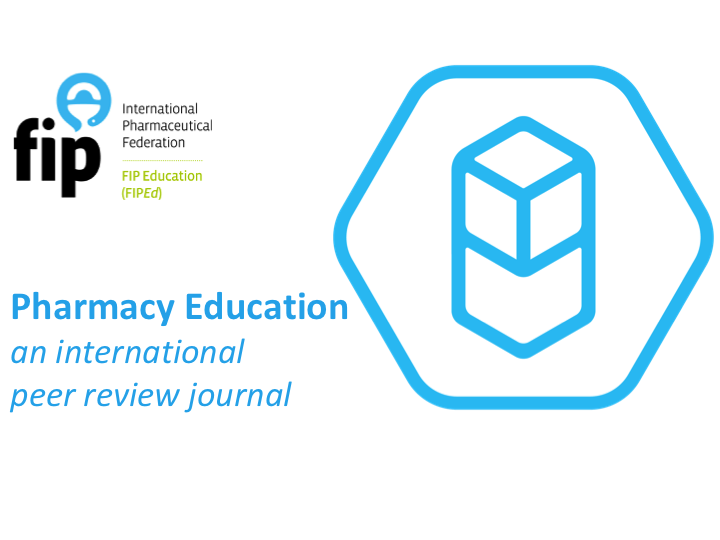 There are new opportunities emerging for practitioners to undertake extended and advanced roles and a master's degree is becoming the international benchmark for pharmacists moving into these roles. Planning your future requires measured decision making even at the undergraduate and intern level and decisions around postgraduate study should consider the ability to articulate to higher level degrees. Includes the Monash Intern Training Program and the Intern Foundation Program, which leads to registration as a pharmacist and helps with the transition from student to competent health professional. * includes a series of compulsory seminars held on campus at the Faculty of Pharmacy and Pharmaceutical Sciences in Parkville. Top ten reasons to complete your ITP at Monash. The Graduate Certificate offers a great opportunity to extend your learning in a range of areas without committing too much time or money. I chose to study health economics, which was closely related to my work at the time. 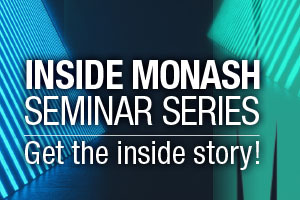 For me, completing the internship with Monash was a no-brainer - the history and reputation of the Faculty puts its graduates ahead of the pack.